Game of Thrones Writer Cites Marvel's Stan Lee as Big "Influence"
Game of Thrones creator George R.R. Martin believes that Marvel's Stan Lee "introduced the whole concept of characterization" to comic books. At this point we feel pretty safe in saying that George R.R. Martin is one of the important writers of our time. Setting aside the fact that his work inspired HBO's Masochist Viewer Hour (a.k.a. Game of Thrones), the books they're based on have helped to draw countless readers into the fold of fantasy fiction and arguably reinvigorate the genre as a whole. Considering these accomplishments, as well as the rest of his large body of work, you really do have to wonder where the heck he gets all his ideas? The answer may lie with Marvel Comics and Stan Lee. You see, back when was younger, Martin was an avid reader of Marvel's comics and frequently write into the publisher with fan letters that, on an occasion or two, found their way into the correspondence sections of the books themselves. Martin was recently reminded of his forays into fan letter-ism by actor John Hodgman who approached the writer with a photocopy of one of his write-ins. 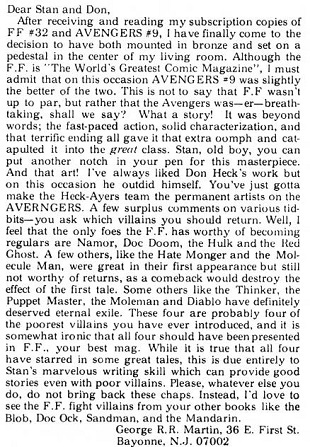 In the letter Martin complemented Fantastic Four #32 and Avengers #9. Amused, he offered further commentary into the role of Marvel and comic books in both his life and his development a writer. "It's hard to understand, I think, from the vantage point of 2011 exactly what was going on in comics back in the early '60s. The Marvel comics that I was writing letters to were really revolutionary for the time. Stan Lee was doing some amazing work," said Martin. "The Marvel characters were constantly changing. Important things were happening. The lineup of the Avengers was constantly changing. People would quit and they would have fights and all of that, as opposed to DC, where everybody got along and it was all very nice, and of course all the heroes liked each other. None of this was happening. So really, Stan Lee introduced the whole concept of characterization [chuckles] to comic books, and conflict, and maybe even a touch of gray in some of the characters. And boy, looking back at it now, I can see that it probably was a bigger influence on my own work than I would have dreamed." Amusingly, Martin's also expressed disappointment over Marvel's decision to revive Wonder Man, who was introduced and then supposedly killed in Avengers #9. In his comments he chalks it up to "being comic books," but still, it's hard not to wonder if Game of Thrones is maybe his way of compensating for the lack of death in the reading material of his formative years.